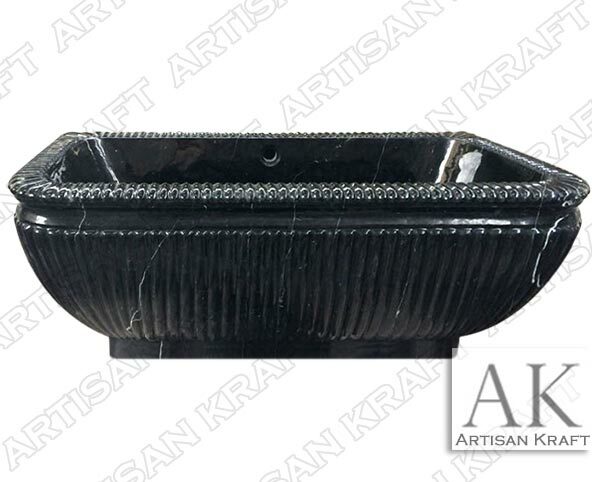 Intricate fluted rectangular tub in black forest marble and polished on all sides. Soak the night away in this freestanding royal bath design. The top ledge of the bath also has a beaded design. Order this tub in longer and deeper size for a larger design. Upgrade with a soaking side and overflow drain. A beautiful matching sink made from the same stone come for free. While promotional deal lasts call in for info. Visit our showroom to view more freestanding soaking bathtubs made from natural stone.